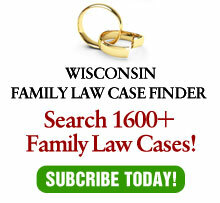 While I was away, the Wisconsin Law Journal published my article on two unpublished, but citeable, cases where a prenup was found to be unenforceable due to changes in circumstances after the marriage. This is a very difficult issue and circumstances always change after a marriage. In fact, its cases like these which led my office to stop drafting prenups years ago. For lawyers who do – and people who sign them – take notice.